Massachusetts Gay Head Sheet. Massachusetts (Dukes County) Marthas Vineyard Sheet. 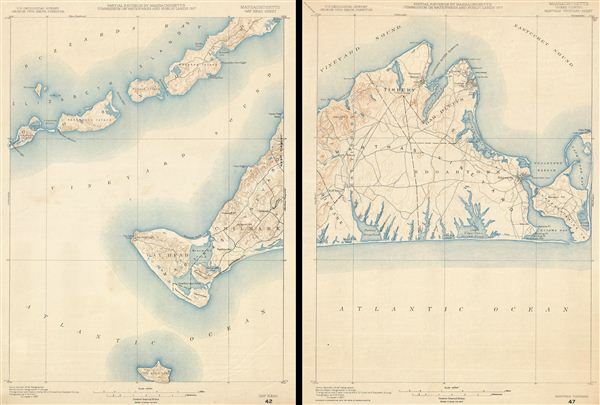 An uncommon U.S. Geological Survey map, in two sheets, of Marthas Vineyard, Massachusetts, from 1917. The left sheet details Gay Head and Chilmark as well as parts of Buzzard Bay and the elizabeth Islands. A smaller island to the south of Gay Head is identified as 'No Mans Land.' The right sheet contains the Bulk of Marthas Vineyard from Chilmark to Chappaquiddick Island and Cape Pogue Bay. Includes both edgartown and Vineyard Haven. Both charts are drawn from survey work completed by the U.S. Geological Survey in 1887 and have been updated under the U.S.G.S. Director George Otis Smith to 1917. Good. Light overall age toning. Else clean.